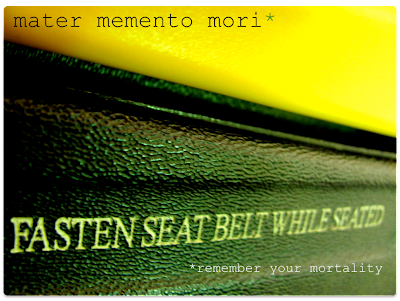 The Beautiful Blog: Remember your mortality! Life is wise, I have learned that; it is what I have chosen to believe. I need to be wise to be in harmony with life. What has happened, whatever it was, It is gone. It is 2009. You are now here, in 2010. Choose to let the suffering go and embrace life with a smile as a source, not only in the face. It is all about choices, YOUR CHOICES. And your choices are the only ones that matter. At the end of each day, you go bed with that, with the choices you have made, those are the last companions right before you fall asleep. I don't know what your story is, but it is a story that you are telling yourself, the history of what happened is made of the facts, the story can always be told in a different manner. Choose to tell the story in a way that do opens possibilities. Well, with that being shared, I wish you Beautiful Choices and see you here next week! Don't forget we have only 9 places left for our Beautifully Observing 101 Retreat in March 2010. Edysoooon! How can I subscribe to get new posts BY EMAIL? Don`t find the feature!!!! Oriana, the form to subscribe by mail has bee added to the right column! Thanks for noticing and sharing the missing widget! Thanks for kipping the "beautiful" inside of me alive. May you always stay "beautiful" and "green" to us all! Ps - I really miss earring your voice saying "Good morning, Beautiful individuals" to us all, at the office! Thanks a lot for taking the time to leave a comment. Get our posts in your e-mail inbox!